Yamaha & Mercury Cylinder head repair, automotive and light truck. Baltimore Head Works is a state of the art machine shop specializing in the repair and remanufacture of cylinder heads for both automotive and marine. consumes about half of the time required to rebuild a cylinder head . Cleaning is done in several different ways and may be repeated several times between machining operations. > Pressure washing is the first step. Get the dirt and oil off so the head can be checked out. > Bead blasting of valves and ports. > Aluminum oxide blasting for cast iron . > Ultrasonic cleaning for concealed carbon deposits and before final assembly. is done on all heads prior to any machine work to assure a sound and crack free casting. Pressure testing is accomplished with a “Delta” pressure tester. 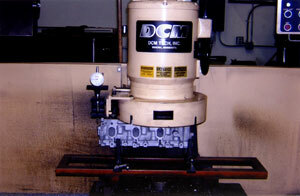 is accomplished with a “DCM” mill utilizing “CBN” cutters. 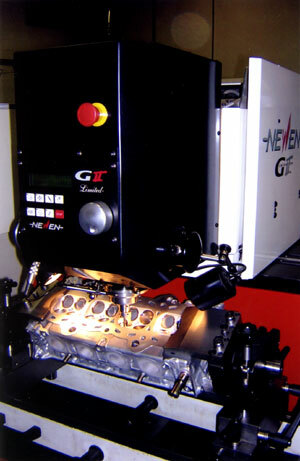 This machine imparts a surface finish below an Ra of 20. That’s smooth! With the introduction of “MLS” gaskets, multi layered steel, smooth is not only better it is necessary. All valve jobs get milled to not only flatten the surface but also to give the head gasket a better environment in which to seal. is performed on any over head cam cylinder head that has been over heated, warped and the cam binds in the cam journals. The cam caps are simply machined at their mating surface, reattached to the head forming a smaller opening for the camshaft and the head is then machined back to it’s original dimensions. Many over headed or oil starved heads have been saved with this procedure. is performed on heads that have been warped, usually bowed up in the middle, from over heating. 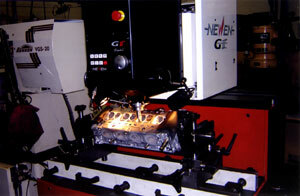 A cylinder head that would otherwise have to be scrapped can many times be straightened. This is done with the use of an oven, a torch or both. A head that cooperates most often then does not have to be line bored. is accomplished in several different ways. Is the crack repairable by welding or by using lacing plugs. Welding requires that the crack be completely cut out first. The head is then heated in an oven to approximately 450 degrees then the TIG welding process starts. The head is allowed to cool slowly, preferably over night. The head is then pressure tested again. Lacing plugs are also used . Plugs from manufacturers such as Loc N Stitch, and Time Sert are used as an economical way to repair a small crack thus avoiding the additional expense of welding. Cracks between valve seats are the most common repair of this type. for spark plug threads and fasteners. Inserts from manufacturers such as Heli Coil, Time Sert and Loc N Stitch are used depending on the particular application. The 5.4L Ford, short thread spark plug engine, is repaired using inserts developed by Loc N Stitch. All inserts are installed using Loc Tite thread sealant. Baltimore Head Works is a small company that is equipped with the most modern machinery available today. Combined with years of experience the company can produce a quality product in a timely manner.